Simplified user experience—Use Adobe Connect more intuitively. With the new user interface, you can easily discover all available functions and features through better organization and prominent display of the most important and frequently used controls and capabilities. Enhanced audio and video controls—Access audio and video controls centrally. They are prominently displayed and logically organized at the top of the meeting bar. All related capabilities are now centralized and easily accessible directly from each control. Unified attendee management—Access all participant management functions from the Attendee pod. 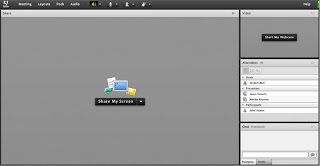 Hosts can change participant roles using simple drag and drop and assign video, audio, or screen-sharing rights using mouse-over controls. Presenters can quickly get a vote count using the new status view and easily control breakout sessions using the new breakout view. Optimized screen use—Size your screen area for optimum viewing. 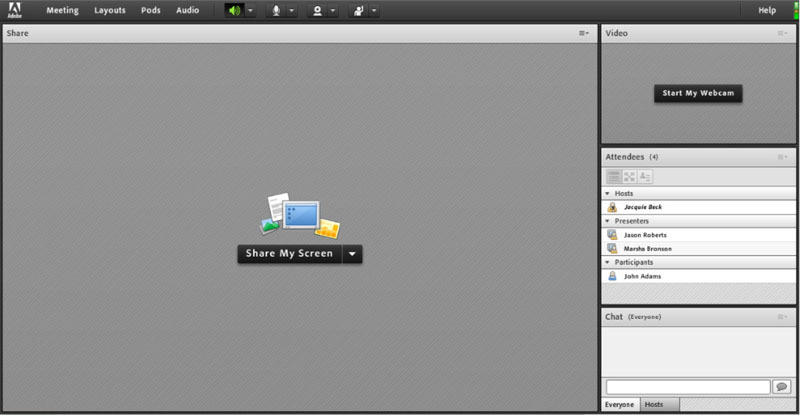 The meeting interface rescales intelligently to provide optimum viewing experiences for any screen size or resolution. Presenters can now size their own version of the presenter-only area individually without impacting the view of other presenters. Improved accessibility—Navigate the Adobe Connect 8 interface completely via keyboard. Several hot keys are also supported for direct access to important functions and capabilities. Significant improvements in screen reader compatibility include JAWS and Win-Eyes support and accurate focus-location tracking by screen magnification software. Advanced chat—Organize chat into separate tabs for public and private conversations and reduce errant chat messages. Participants can choose the color and text size of their chat messages. 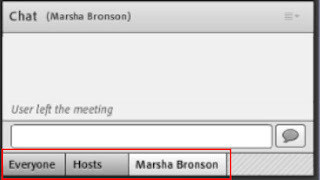 Hosts can control whether private chats are allowed in a meeting room. Rich Notes pod—Use rich formatting capabilities in the Notes pod, such as bold, italics, multiple colors, and bullets. The Notes pod also includes productivity and accessibility improvements like support for keyboard shortcuts. Hosts can save notes as an RTF file on their local drive and then email them to multiple participants directly from the Notes pod interface. Video conferencing integration—Leverage existing investments in video conferencing solutions by integrating your video telephony devices supporting SIP/H.264 with the Adobe Connect platform (for on-premise deployments only). With this new feature, meeting hosts now have the option of bringing a live audio/video broadcast stream directly into an Adobe Connect meeting room. New optional desktop client— Set up and manage meetings more easily with the new optional Adobe Connect Desktop AIR® client. Invite participants to meetings right from your desktop. You can also instantly search for recorded Adobe Connect sessions, and download and playback recordings locally, even when offline. New and enhanced plug-ins— Use the Microsoft Outlook add-in to schedule Adobe Connect meetings from your Microsoft Outlook Inbox based on your Exchange Calendar Free/Busy time. Using the Adobe Connect Add-in for Microsoft Office Communicator, see online and available contacts, then invite them to meet in your Adobe Connect room using your existing MOC client. Passcode-protected meeting rooms—Set and manage passcodes over some or all meeting rooms to better manage participants and control meeting access. Hosts can set and reset passcodes that participants are required to enter upon login, protecting sensitive information. Session management—Manage meeting session length for strengthened security and finer grained control of user sessions. Allow users to hold sessions for as long as necessary, while ensuring that idle sessions time out, reducing the risk of unwanted meeting access. Looks like a worthwhile upgrade with many new features that would be useful for us and our learners/clients. Our next step is to try this version out for ourselves and see how it functions. We'll see if we can get this version installed on our test server. I like the new interface but the changes are primarily for Connect meeting which we don't use as often as the presenter side. I would have liked to see more upgrades to the presenter functionality, specifically assessment. I'm excited to try the new version when it becomes available.